Smart speakers are dramatically affecting consumers’ daily lives. Are they the next step for modern surveys? 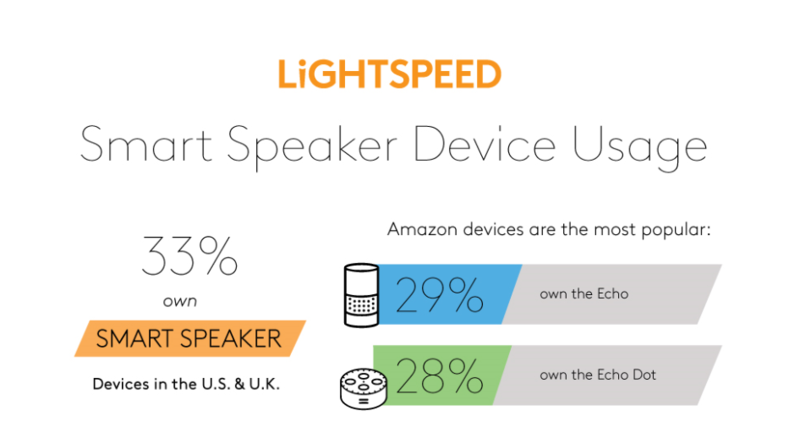 Respondents are demanding that we supply them with shorter, more engaging surveys, so at Lightspeed we opted to do some research around smart speaker devices. Which devices do they own? How much do they use them? Are they willing to use them to answer research questions? We interviewed 1,097 US and 1,177 UK Lightspeed panelists, including those on the VICE Voices panel, in March 2018. Download our infographic and explore some of these results. Fill out this form to download the complete infographic! Quality-seeking researchers, marketers and brands choose Lightspeed as their trusted global partner for digital data collection. Our innovative technology, proven sampling methodologies and operational excellence facilitate a deep understanding of consumer opinions and behavior. With 700 employees working in 14 countries, we maximize online research capabilities. We empower clients by revealing information that is beneficial, providing clarity and research data that illuminates. Headquartered in Warren, New Jersey, Lightspeed is part of Kantar, one of the world’s leading data, insight and consultancy companies. For more information, visit www.lightspeedresearch.com.